Most Egyptian Christians belong to the Coptic Orthodox Church, which broke away from the Catholic Church after the Council of Chalcedon in the fifth century. However, after a brief reunion in the fifteenth century amidst the Ottoman conquest and a subsequent period of Franciscan and Jesuit missionary activity, some Coptics became Catholic in the eighteenth century. In the nineteenth century, a patriarchate of Alexandria in communion with Rome was restored. The current Catholic patriarch of Alexandria, Ibrahim Isaac Sidrak, took office in 2013. Ibrahim is not yet a Cardinal, but the previous Coptic patriarch is. Ibrahim is visiting the United States, to participate in meetings about the protection of Christians in the Middle East, and to visit the Coptic Catholic churches here. The Coptic Catholic Church has adopted some customs of the Roman Rite, including the calendar of readings established after Vatican II. Coptic Catholics also have significant Catholic devotions such as the Rosary and the Sacred Heart. However, the Coptic Catholic Church celebrates Mass in ancient liturgies of the Alexandrian Rite which differ significantly from the Roman Rite. We attended Mass in the Liturgy of St Basil, in a version which combined Arabic, Coptic, Greek and English. The majority was in Arabic, including the use of the term Allah for God. Many of the chants were in Coptic, while the Kyrie, sung in Greek in an unusually fast and repetitive meter, was the most familiar part to us. The chants were sung with percussion accompaniment, with musical settings that had much eastern influence. We had each previously attended Mass in the Byzantine Rite. The Coptic Mass differed even more significantly from Roman, so this way of worshiping was new to us. 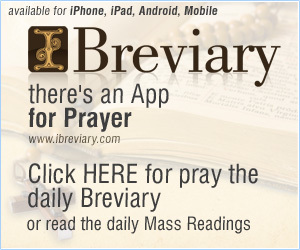 However, we found it quite spiritually uplifting, especially the translations of the prayers, which are arguably more elaborate and detailed even than the Tridentine Latin Mass. Communion is taken on the tongue, with the bread dipped in wine as is done in the Byzantine Rite, but without a spoon. Finally, we will end this long post with some discussion of another important part of our Sodality which we have not yet mentioned on the blog. Since February, most of the leadership of the Sodality (Skylar, TMR, Matt, Michael, and more recently Liz), along with several others, have attended a Bible study which was started by one of the missionaries from FOCUS, the ministry which is resident at St Mark’s Parish in Isla Vista. From February until May we studied the concept of salvation history, focusing largely on Genesis. Throughout the summer we studied from the Book of Proverbs, and we are now studying the Book of James. Some people have been surprised by our wide-ranging and often uproarious intellectual discussions, comparison of different Bible translations, and unique ways of relating the Bible to life in general. The Bible study usually meets Mondays at 8 PM. Next week we are planning to post in honor of the feasts of St Francis and St Therese. 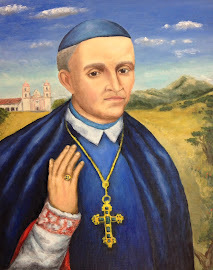 Following that we will post another interview with Michael about Bishop Garcia Diego and his painting of that subject, as promised. Penny, thanks for your comments. We're glad you are reading this blog. It's refreshing to see young people on fire for God- especially young men giving testimony of faith- wish I lived closer and could join your prayer group... I’ll just have to enjoy reading about it. :-) God Bless!